Timothy J. Sposato started in the railroad industry after high school, and has worked for several railroads and steam operations before hiring-on 1988 when the OCRS steam program first began. Tim is the Chief Mechanical Officer for AoS, and is FRA- certified as a diesel/steam locomotive engineer, fireman and conductor. Bill Goslin began his railroading career in 1971 with the Ohio Railway Museum helping out with the Norfolk & Western 4-6-2 No.578 and has been involved in the steam railroading field ever since. Bill was active with Steamtown throughout the 1970s and 1980s and assisted with the collection’s relocation to Scranton, Penna. During the early 1980s he worked with Jerry Jacobson on the restoration of a locomotive and returned to work with Jerry in the late 1990s. From 2014 to the present Bill is employed at the Roundhouse as mechanic as well as working as a tour guide for our Roundhouse tours. Bill Hanslik started as a volunteer with Jerry Jacobson’s Ohio Central Railroad steam program in 2004, eventually hiring-on at Age of Steam in 2014. In addition to performing locomotive and equipment repairs, Bill conducts extensive research to faithfully repaint and letter locomotives freight cars, and other parts of the collection. At the time of this writing, Bill has lettered more than 20 pieces of Age of Steam’s railroad equipment collection and replicated numerous vintage signs for use at the facility. Greg R. Miller hired-on with the Ohio Central Railroad System in 2001 as a maintenance-of-way employee where he operated many types of on-rail track equipment for the replacement of rails and ties. Greg was instrumental in the construction and maintenance of the rail yard, turntable trackage and turnouts here at AoS, and works as a mechanic for our rail equipment repairs. Alan Layman is from nearby New Philadelphia, Ohio. He enlisted in the U.S. Army right out of high school, and worked with computers and communications. After being discharged Alan was hired by the Age of Steam Roundhouse to work as a general mechanic. In order to increase his skills for the big job of repairing railroad rolling stock, Alan is currently attending welding school during the evening. 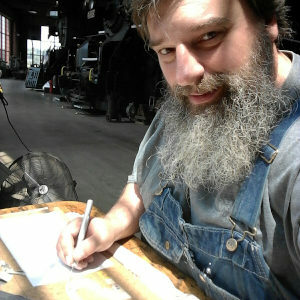 John C. Leck started his position in the Age of Steam shop in May of 2018 and takes on a variety of mechanical department duties. His prior work in manufacturing and the petro-chemical industry honed skills in large machinery re-builds, project management and facilities maintenance. He spent over 9 years working as a field reliability engineer in the Prudhoe Bay oil fields. 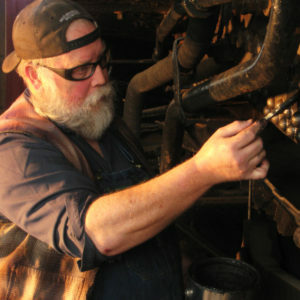 John has been actively involved in the antique steam engine hobby for nearly 20 years. As the owner of three steam traction engines, he has developed a significant amount of experience in historical boiler operation, maintenance, and restoration. His technical knowledge, coupled with his many associations with others in the antique steam engine hobby, keep him at the forefront of all the current issues pertaining to historical boilers. John is a member of the State of Ohio Historical Boiler Licensing Board and enjoys being a liaison for hobbyists in the northeast region of the state. John, his wife and five children reside in Tuscarawas County on their homestead farm. 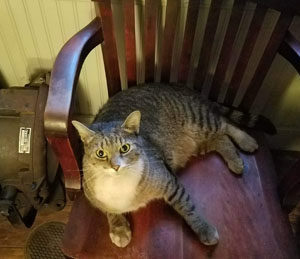 Felix the Roundhouse Cat arrived at Age of Steam in 2015. Felix can typically be found supervising work while perched on our Chief Mechanical Officer’s desk, and occasionally dabbles in mouse prevention. He recently got his paws on a Twitter account – follow Felix at @RoundhouseFelix.